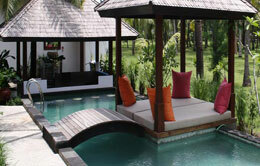 Gili Trawangan Resort is the Luxury accommodation in Gili Trawangan. 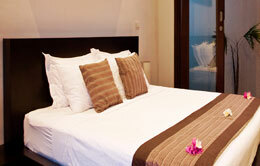 Gili Trawangan Resort offers three kind of Room; Single Suite, Two Bedroom Villas and Four Bedroom Villas. The Villas located closed from the beach where you can enjoy the sun, sea and white sandy beach. Gili Trawangan Resort located in Gili Trawangan, Gili Trawangan is located of just off the northwest coast of Lombok – an island of stunning natural beauty. 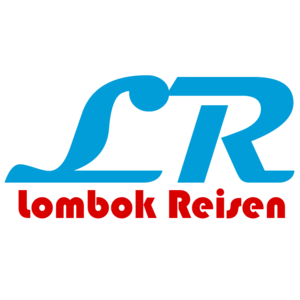 Lombok is an unspoilt alternative paradise island to Bali; only 25 minutes flight time from Bali, but a world away in terms of crowding and environment. Bedrooms feature queen-sized or twin beds, individually controlled air conditioning, ceiling fans, flat screen televisions, DVD players, fully stocked mini bar, and tea and coffee making facilities. Enjoy a range of international movies, news and popular program, or choose a new release from our movie library. Semi open air bathrooms allow you to shower under the sun and stars! Each en-suite bathroom has hot and cold fresh water showers and western standard fittings. Each suite is designed for privacy, Step through the outer doors into a world of your own, screened off from the main Resort by double locking doors and a private entrance area. Dine at tables under the swaying palms and sun bathe on lounges next to the pool. The swim-up pool bar is the perfect place to meet friends while having a drink. All villas feature individually controlled air conditioning, ceiling fans, LCD televisions, DVD players, stereo systems, hot water, fully stocked mini bar, and tea and coffee making facilities. These villas have two separate bedrooms, each with private ensuite bathrooms. Separated by decking to give personal space, each bedroom looks out onto the pool and sun deck. The spacious living area creates a comfortable space for when you wish to relax together. A romantic dining area, large modern couches and a self contained kitchenette with essential cooking facilities provide convenience and comfort for two couples sharing or parents with children. Each villa features a private courtyard for relaxing and soaking up the sun. Shielded by privacy walls, the courtyard gardens feature private swimming pools, a poolside bale for relaxing on the cushions in the shade, and sun lounges for working on the perfect tan. Each bedroom has its own ensuite bathroom with private fresh water shower, hot and cold water and western fittings. Bedrooms are large and airy with queen-sized beds, and have individually controlled air conditioning and satellite televisions. The spacious living area means groups can get together comfortably. Watch movies from our movie library on the large screen television, play games and dine in the privacy of your own dining room. We understand that sometimes you don’t want to dine out and just want to make something quick and easy to eat. The villa features a self-contained kitchenette with gas stove, large refrigerator, kettle, cutlery and crockery and basic cooking equipment. Enjoy all the facilities of our Resort, or relax in private behind the screening walls of your villa. Our 4 bedroom villa is screened from view with careful plantings and has its own swimming pool and sun deck areas for family and friends to play in privacy. No Cancellation Fee will be charged on cancellation received by us 10 days prior to arrival date and for cancellation received less than 10 days prior to arrival. During High Season (from the whole August and from 20th December to 5th January)Cancellation Fee will be charged on cancellation received by us 15 days prior to arrival date and for cancellation received less than 15 days prior to arrival.